I’ve been bragging about the health benefits I’ve experienced since drinking sole water over the last few months as I work to recover my health (read about me here, then read my story I have Lyme disease, but it’s not a big deal). I figure it’s high time I tell you all about it! You need to know how to make sole water, but you also might want to know why you should! 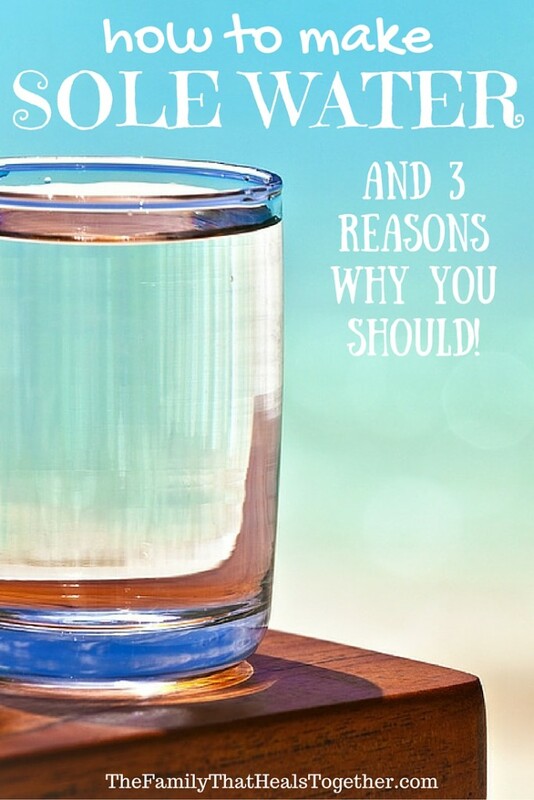 I started drinking sole water (pronounced “sol-ay”) sometime in December or January, when I began working extra hard to recover my adrenals from a major crash. I had read about how sole water was very good for supporting the adrenal glands, but I wasn’t sure about why. When I did a little research and found out how very, very easy it is to make and administer, I figured I might as well give it a try. I noticed the benefits almost immediately! Salt gets a bad rap for causing high blood pressure, but did you know that good salt has tons of good health benefits? 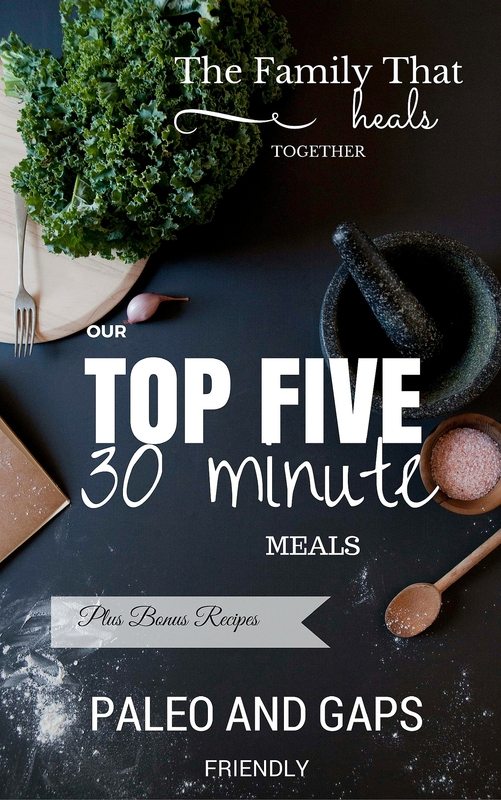 Salt is an amazing source of trace minerals, many of which you can’t easily get anywhere else. By making a strong salt water infusion, you are jam-packing it with these minerals, which include iodine, copper, zinc, magnesium, calcium, and more! Real Salt– this is my favorite salt and one I use every single day in cooking, flavoring, and my good ol’ sole water. I like to buy it in bulk since I use it so frequently. Real Salt comes from ancient sea beds in the US (Utah), so it is not subject to modern-day ocean contamination. It is pink with flecks of other colors and can be gritty due to the high mineral content. Himalayan salt– also mined from ancient sea beds, Himalayan salt is pink and is also rich in minerals. Celtic sea salt– gray in color, Celtic sea salt is also a good source of minerals. These are all good options and boast benefits that refined white table salt does not, as white table salt is not only stripped of nutrients and bleached, but sometimes contains additives. Sole water helps the body to detox unwanted toxins and pathogens, by helping to improve hydration and absorption of nutrients. Salt is antibacterial and may assist in removing bacteria from the body. When our body is well hydrated and nourished, the immune system is strengthened, and our bodies are better able to fight off pathogens as well as eliminate toxins. Because of the high mineral content, sole water promotes energizing on a cellular level, nourishing your body from the ground up. The word “sole” actually translates to “sun” in some languages, which I think is fitting considering the energizing effects sole water has. This is personally the biggest benefit I’ve noticed from drinking sole water. Each of these benefits is intertwined, and really all go back to the high mineral content. Back in October of last year, my adrenal glands tanked, seemingly out of nowhere. I became more fatigued, was constantly cranky, my blood sugar was all over the place, and my hair began falling out. It was scary and I felt out of control, as the symptoms persisted for months. I began to research how to recover from adrenal fatigue (I’ll be writing a complete guide to how I recovered, so be sure to subscribe to the newsletter here so you don’t miss it). 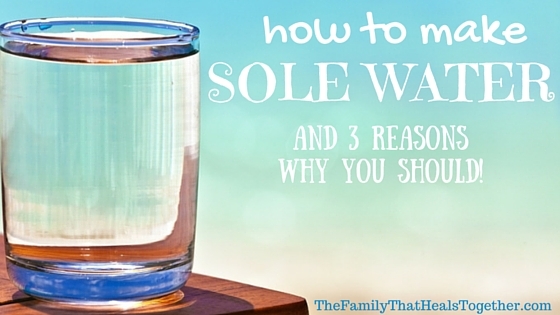 In my research, I came across sole water and decided to give it a try because it was a cheap and easy solution. I noticed a difference within a couple of days of drinking sole water! My energy levels improved right away. My blood sugar began to stabilize. My hair stopped falling out. It felt like a miraculous recovery! When I incorporated sole water into my adrenal fatigue recovery protocol, it just worked. Best of all, it’s super cheap and easy to make! All you need is a cup of salt (see above for those I suggest), a quart-sized jar with a plastic lid (like this) and filtered water. Put 1 cup of salt in the jar, then fill it the rest of the way with filtered water. Cover the jar tightly with a plastic or other non-metal lid and give it a shake. If the cup of salt is completely dissolved, add a little more until it doesn’t dissolve. This is how you ensure the water is totally saturated. Take 1 teaspoon in the morning on an empty stomach (you may need to work your way up to this) in a glass of water. I personally now take a tablespoon in the morning, and often taken another tablespoon once or twice more in the day if/when I think about it. I never had any die-off (a reaction to detoxing too quickly) from drinking sole water, but you may, so should start slowly and work your way up to the dose that feels right. Now that you know how to make sole water, give it a try! It’s so easy and inexpensive, you have nothing to lose! Share below so your friends can learn about this simple solution. Where do I find these salts? Thanks for sharing! Do you shake it up before you get your teaspoon? Why or why not? Thanks again! I’ve never heard of that before, Rose. I’m not sure what would cause that. Could it be because your body is working much better? My feet used to be super cold and I read at the time that it was because my body was not working well. I have found something on a French site for you, there is the google translation: “The burning feet can be the result of a food imbalance and a bad hygiene of life. Indeed vegetarians tend to suffer more feet than others for the simple reason that they have a deficiency of vitamin B that is found in particular meat. Review the contents of your plate by consuming more legumes, nuts, wheat, veal liver to cover your vitamin B needs. If the symptoms persist, it is advisable to consult your doctor. Feet that heat or burn can be the result of certain physical conditions that it is necessary to treat. My sole water is brown. Did I do something wrong? I don’t know… mine looks a little brown, but I guess it depends on what kind of salt you used and how much of it, or if it possibly got contaminated. How do you get your kids to take it? My son FREAKS OUT when I try to offer him Sole! I can’t sneak it into anything, even a homemade gatorade! Any tips here? Thanks so much for sharing. Where’d you find the quart jars? I used a quart Ball canning jar and one of the “plastic” lids sold especially for these jars. They say not to use a metal lid as the salt vapor will cause it to corrode. Also, don’t serve or even touch the sole with a metal spoon….I serve mine with a plastic measuring spoon. Can I drink sole water and take a multi vitamin? I don’t see why not, though I prefer to stick with herbs and single nutrients myself. I guess there could be a risk that electrolytes could become imbalanced when combining sole with a multivitamin. Thanks for this! I have just two questions: 1. Can I use a glass jar with a glass lid? 2. Can I use distilled water? I wouldn’t use distilled water. It will actually pull minerals from your body. Use spring water. Mineral Deficiencies. Drinking distilled water robs your body of its natural source for many minerals essential to good health. This results in mineral loss in the body with increases your risk for osteoporosis, osteoarthritis, hypothyroidism, hypertension, coronary artery disease and premature aging. Can I use spring water instead of filtered to make sole? I know coffee is acidic,how long after drinking the sole can I have my cup in the morning?.also you said you take it a couple times a day,do you have to wait a certain amount of time between meals? I figure some benefits is better than none. Sole water actually improves digestion and helps your stomach create hydrochloric acid, so you shouldn’t have to wait for meals. As far as coffee, that’s a good question (I don’t drink coffee). All I can say is you can experiment and see what works best for you. Not that I’ve ever heard, but everyone is different! Hi, how long will the sole water keep after being made? Indefinitely, really, as salt is naturally antibacterial, and it should have a lid on it. Great article. I made the sole water. I forgot and accidentally used a metal spoon to take a teaspoon of sole water out the jar. Is the whole sole ruined now? Should I start again? Thanks. I think it’s fine, so long as it doesn’t remain in contact with metal for long.